← Justice, where is it? 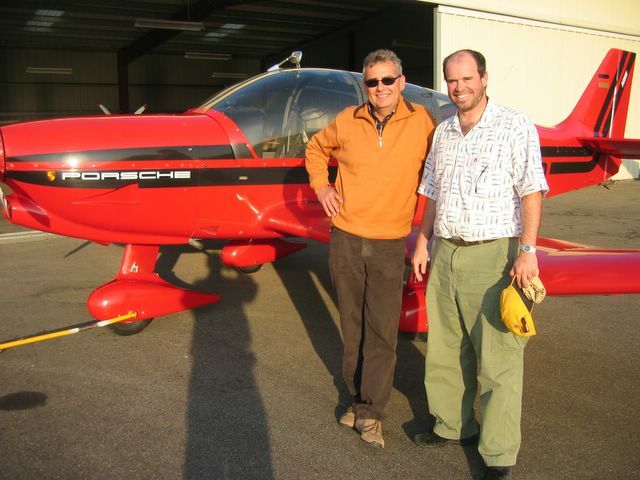 The flight with Andreas in the Porsche powered DR400 just served to remind me that I really want to FLY an airplane. The club rules (and common sense) prevented Andreas from allowing me much pilot in command time in the Robin. The flight sated my desire to see the world from the air but did little for my need to rock the wings. With my German constantly getting better I found a general aviation club based right at Stuttgart airport. Stuttgart is a pretty good sized class C airport where GA planes share the single runway with the big boys. Seemed like a good place to get the feel of German air traffic. 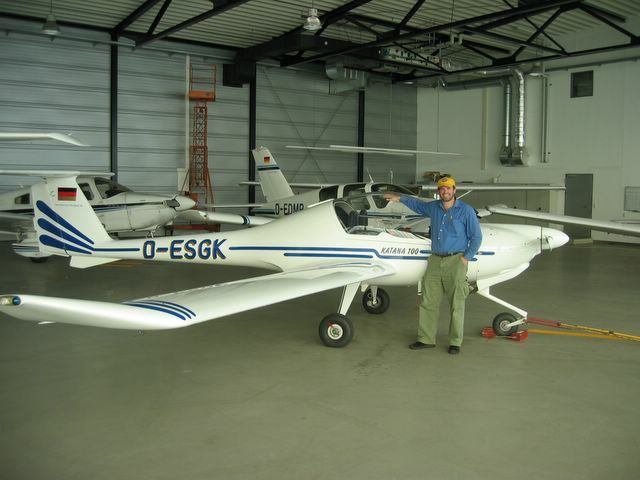 I emailed the club and hooked up with Werner, a designated examiner for the European equivalent of the FAA (the JAA). He agreed to let me fly the club Katana as long as I took him along for the ride. I have flown 8 different planes since starting my license and I really enjoyed the time in the Cessna 150 at Friday Harbor. Since the Katana is also a two seater, but a completely modern one I thought it would be a gas to fly. I was right. Germany has been enjoying an unseasonable spate of sunny skies and cool, but clear air, so I was really looking forward to seeing the foliage from the air. I arrived early at the airport and found yet another general aviation operation so I grabbed a price list. They told me that with a checkout I could fly any of their planes by myself. This seemed too good to be true, but it certainly sparked an interest. Next time, first the Katana. Werner and I took off with no mishaps. The ground and tower gave reasonably clear English instructions and I have no doubt I would have done fine on my own. Werner only grabbed the stick once and that was to make a minor course correction for our exit from the class C airspace. I could have done it myself had he been able to give clear instructions, but I think his English lagged too far behind his thinking for him to risk telling me what to do. This problem reared its head on the landings as well. We flew an absolutely gorgeous route that I highly recommend to the Stuttgart visitor. We flew along the Swabian Alps until we hit the Hohenzollern castle. This fairytale number warranted a few circles then we continues on to Ruetlingen. From there we headed west towards the Schwazwald. Whipping the Katana along through the valleys towards the Dönau river was a complete gas. Often the plane was below the level of the surrounding table lands as we slalomed along. At the Dönau we hooked a right and buzzed another couple of castles and a few really nice looking towns. Then we did a one-eighty and headed back towards Neuschwanstein. Well short of there we decided to land at Mengen. The pattern at Mengen is not close to a normal left traffic rectangle. There are all sorts of jogs and dodges that get slipped in because of noise abatement. Since I could not be told how to fly the pattern in real time this led to the stick being yanked around a bit by Werner. It was really annoying since I was trying to get the feel of setting up the Katana for landing. We did two landings at Mengen so that I woud have three altogether. That allowed Werner to sign my book allowing me to drive Katanas while here. At least I can after I get a JAA license. We paid the tower at Mengen for our landing. Far more surprising than the different tower and ground controllers is the ubiquitous landing fee here. The fee ranges from a few Euros to over a hundred for airports where they do not want general aviation traffic. Stuttgart is over a hundred bucks for a single engine if it is not based there. The mysteries of the landing fee are still a bit murky to me as the prices Werner quoted were quite different from those mentioned by the FBO. After Mengen we headed back to Stuttgart and again the approach involved enough dodging that I kept getting the stick taken away. My landing was really nice though and did not have a bit of assist from Werner. My evaluation of the Katana is that if you have the money you should buy one over the 150, but since I have no money I will dream of a 150/152 with VFR instrumentation. A spectacular day flying a really nice plane. When I returned to the lab I was still so giddy that I must have seemed high. My enthusiasm was catching because when I mentioned where I had been to my collaborator he immediately wanted to go flying with me. Hmm I though, perhaps it would be rude to leave Germany without taking my host up for a short spin.